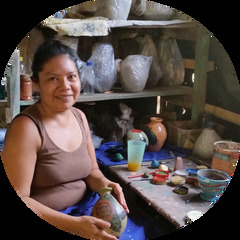 Handmade by Eliezer Hernandez, this tilted clay pot is painted and etched with designs inspired by nature. The pot, which is 4.5 inches tall and 5.5 inches in length is low fired and had a chameleon design. Signed by the artist, the pot is not designed to hold water.